The first of those complaints (i.e. conditions at ADX Florence) was held to be inadmissible in relation to the 4th applicant (Abu Hamza) since, given his physical condition, there was "no real risk of his spending anything more than a short period of time at ADX Florence" [judgment para 5]. The court was not in a position to finalise the 2nd applicant's case and required further submissions from the parties. Examination of his complaints was therefore adjourned. For more on ADX Florence, see The Guardian 10th April 2012 - "ADX Florence supermax prison: the Alcatraz of the Rockies"
Article 3 of the European Convention states - "No one shall be subjected to torture or to inhuman or degrading treatment or punishment." The court held that in relation to the 1st, 3rd, 5th and 6th applicants there would be no violation of Article 3 as a result of conditions at ADX Florence and the imposition of Special Administrative measures post-trial. The court also held that there would be no violation of Article 3 as a result of the length of the sentences which would be likely for the 1st, 3rd, 4th, 5th and 6th applicants if convicted. In April, the court's judgment was not final since Chamber judgments may be referred within 3 months to the Grand Chamber - (Article 43 of the Convention). The court applied Rule 39 of the Rules of Court which, in effect, prevented extradition taking place until further notice. This was a holding position to allow for any reference to be made to the Grand Chamber. A reference was duly made to the Grand Chamber which has refused to hear the matter - see BBC News 25th September 2012. The judgment of 10th April has therefore become final and, on the face of it, extradition of these men will now be possible unless some other obstacle is either raised or encountered. The popular British media are delighted at this ruling. A few concerns remain however. The first is the matter of delay. If people are not too bothered about the length of time these cases have taken then they should be. Delay is inimical to justice as was recognised centuries ago in Magna Carta with its famous declaration - "To no one will we sell, to no one will we refuse or delay, right or justice." Barrister Adam Wagner writes about the lengthy delays in a good post on UK Human Rights blog. Whilst the judgment [of 10th April] does something to clarify the law relating to Article 3 and Extradition [paras. 166-179] the whole range of cases from Soering 1989, via Chahal (1997) and Saadi (2008) to the present decision should be reviewed with the purpose of the Grand Chamber setting down a clear statement of the law. The written submissions of the respected 3rd Party Interveners were rejected - [see paras. 7 and also 197-199]. The interveners included the American Civil Liberties Union and Reprieve. The submissions were referred to briefly and raised serious questions about the reality of the system in the USA. It is unclear precisely why those arguments were rejected so decisively and fuller explanation was merited. The decision may give encouragement to governments in European Convention States to create similarly severe detention regimes [i.e. to ADX Florence] with only minimally compliant procedural safeguards for those subjected to such regimes. That is correct. As far as I know, Aswat's case remains under consideration by the court. Since posting the above, some light has been thrown on the review to be heard on 2nd October. 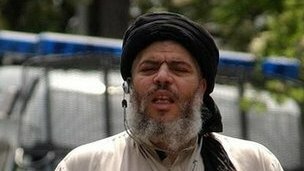 Please see Abu Hamza wants his passport back - UK Human Rights blog 27th September. It remains to be seen whether other points - such as change of health - are raised.